The Okrika Speedboat Owners Association has appealed to the Rivers State Government and other relevant agencies to help clean the volume of debris on the waterways and creeks in the area. The spokesman of the association, Hon George Otta made the appeal in a chat with our correspondent in his office at Okrika last Monday. Hon Otta said as a corporate organisation on public service, one of their greatest challenges had been hard objects, refuse and debris that have invested the creeks and waterways, thereby causing hazard to boat operators as well as passengers. He decried the attitude of residents of Port Harcourt for dumping wastes on the waterways, which according to him should be condemned in its entirety. 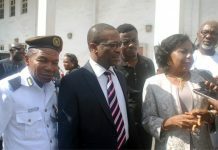 The Public Relations Officer of the association disclosed that the body had made frantic efforts to ensure that the debris and dredging pipes abandoned within the area were removed to afford unecessary boat mishaps and appealed to other relevant agencies and the various communities to assist the union. Hon Otta also called for an enlightenment and sensitisation programme on how best to bag and package wastes rather than dumping them on the creeks and waterways. The Okrika Speedboat Owners Association Image Maker on bahalf of the entire members thanked the Local Government Chairman, Chief Phillimon Kingoli for donating life jackets to the association and further appealed to all to emulate his gesture. He applauded the efforts of the Commander, Sector Three of Joint Task Force (JTF), Col Oloyede for ensuring safety of lives and property along the waterways and creeks, adding that with his efforts, sea piracy has drastically reduced.